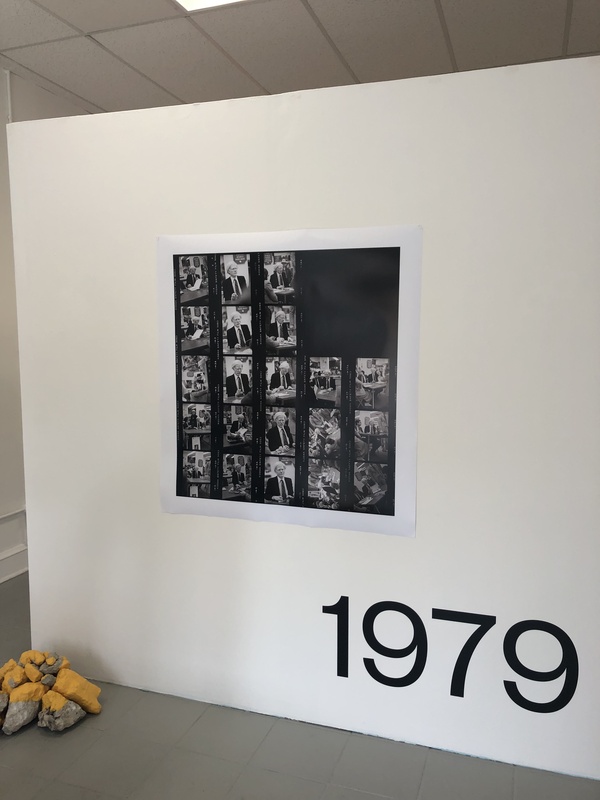 In 1979, Andy Warhol spent two days in Chicago and although it wasn’t a secret trip, it may have been long forgotten if not for an 18-year-old fan from Northbrook. Raúl Niño, who at the time was attending New Trier West, would frequently hop on the El to head downtown and roam around, taking pictures. A big fan of Warhol, he had read his 1975 book “The Philosophy of Andy Warhol” and was a subscriber to Warhol’s Interview magazine by the time he learned that his hero was coming to Chicago and knew that he had to see him. Warhol was scheduled to do a book signing at the long-gone Kroch’s & Brentano’s bookstore on Wabash Avene to promote his book “Andy Warhol’s Exposures” and would also make an appearance the day after at Fiorucci, a new wave clothing boutique that Niño spent a lot of time at, getting to know people in the scene like Joe Shanahan, who worked at the store in the days before opening Smart Bar and Metro. 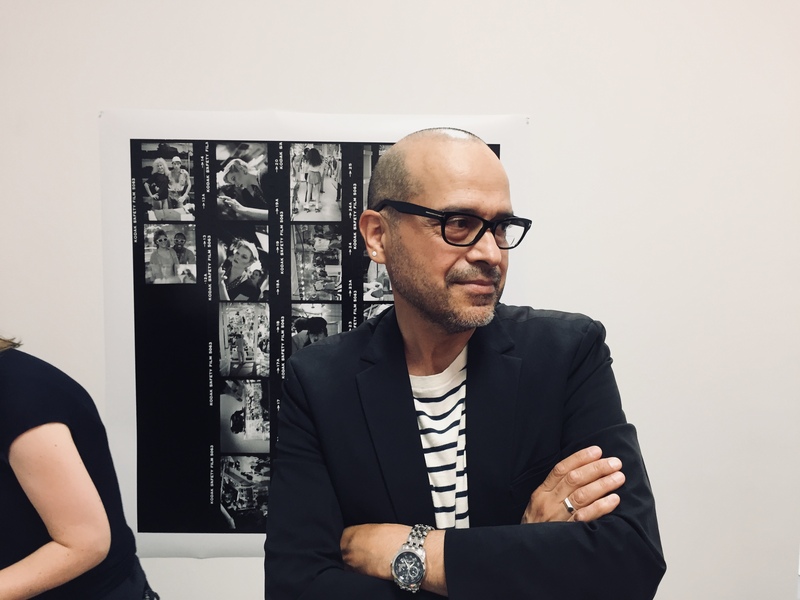 Shanahan and Niño would remain friends over the years and a chance meeting a few months ago at their mutual friend Jason Pickleman’s Lawrence and Clark art gallery led to the first public showing of Niño’s pictures from when Warhol visited Chicago in 1979. Bob Chiarito from The Chicago Ambassador recently talked to Niño, now a poet who works by day as a librarian at Northwestern University from his home in Evanston. CA) How were you able to take pictures of Andy Warhol when you were 18? So I ditched school on Friday and I went to the bookstore and shot a roll in black and white. The next day I shot a roll at the store in color and that was it. I took those pictures and managed to develop the black and white pictures and sent the color film to a lab. I put them in a sheet and that was where they remained. I’d show them to friends over the years but that was about it. I continued to go to Fiorucci until they closed about 18 months later. They didn’t last because they were way ahead of their time. CA) How did the current show come about? You are a friend of Jason Pickleman, correct? NIÑO) Yes, I met Jason many years ago and would see him at art events. He had told me about his gallery and I finally went. On the second or third time I was there, Joe Shanahan, the owner of Smart Bar and Metro was there talking to Jason. I know Joe because he worked at Fiorucci many years ago. That’s where I first met him and he was really nice to me when I was a kid. Joe worked at the espresso stand at Fiorucci. It was a really funky store. The employees smoked cigarettes on the job in the store. They drank champagne. They did other things that were illegal but I never knew about. Joe worked the espresso stand and I would hang out there and get wired. Joe would tell me about things going on. He took me to lunch one day to Hamburger Hamlet. I related all this to Joe when I saw him there a few months ago and we went down memory lane. Joe’s a longtime friend of Jason’s and Jason said, ‘You guys know each other?’ I said, ‘Yes, we met at Fiorucci’ and I asked Joe if he remembered the day Andy Warhol came to the store. Jason said, ‘Andy Warhol came to Chicago?’ And I said, “Yes, and I have pictures.’ That’s what led to this show. 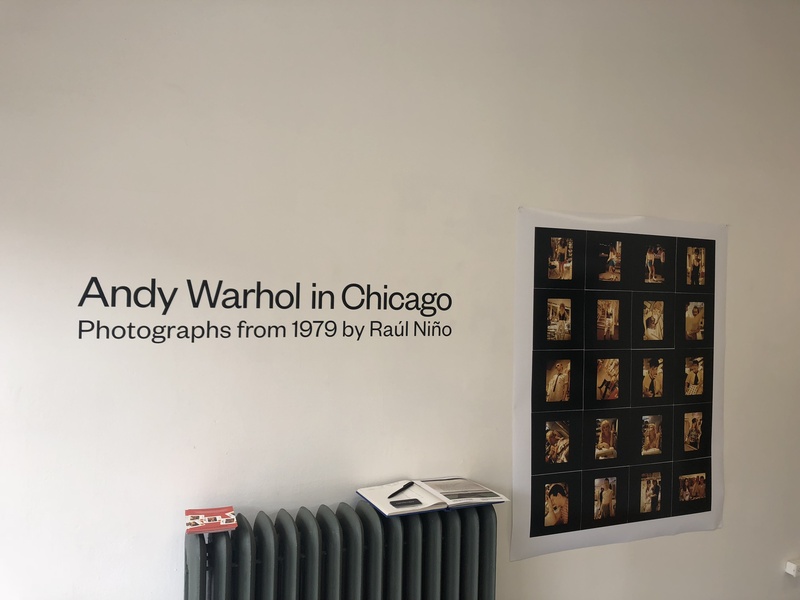 Andy Warhol in Chicago will run through July at Lawrence & Clark, 4755 N. Clark St. For more information, click here. Andy Warhol. Fiorucci. 1979. A kid with a camera. That was me. A Friday and a Saturday. In black and white, and in color. Are memories black and white? Or do they come in color? Interview magazine came in both. Andy Warhol came in color. Fiorucci was all color all of the time. Friday was in black and white, all business. Saturday was in color, a party. Andy Warhol was very quiet, but then so was I.